Stan Garber had a perfectly good reason to be running a few minutes late for his interview with Software Executive. On his way to the call, one of Scout RFP’s business development representatives flagged him down to help out with a prospect. Garber quickly provided what he deemed as “air cover.” This 30-second anecdote wasn’t meant to work its way into this story about a growing SaaS platform that streamlines strategic sourcing and procurement challenges. On the surface, it might sound like Garber was micromanaging. Or that this particular BDR didn’t have enough training. Neither scenario is true, not with the way Garber and his three cofounders have thoughtfully scaled the company since founding it in 2014. After all, this isn’t the Scout team’s first rodeo — Garber with Alex Yakubovich, cofounded the online ordering software platform ONOSYS, which was sold to LivingSocial in 2012. In the four years since Garber and Yakubovich teamed up with Andrew Durlak (Scout’s VP of Operations) and Chris Crane (VP of Product), the startup has been very intentional about its path. Garber doesn’t subscribe to the growth-at-all costs mentality that is so prevalent in Silicon Valley, where Scout is headquartered. He hasn’t tried to raise as much VC money as humanly possible just to spend it on brand awareness and office snacks. Instead, the Scout executive team has focused on smart, scalable, sustainable growth. When Garber and Yakubovich started building the online ordering software for their first company, ONOSYS, they knew that a clean, simple interface and ease of use was key. That was 2007, when online ordering didn’t have nearly the same kind of widespread adoption as it does today. If it took too many clicks to order that pizza, the hungry user would just abandon the online ordering experience and phone it in. ONOSYS was built for some of the largest restaurant chains in the country (to date, the platform has processed close to $1 billion in food sales). One of those large customers took five years to court. During that process, Garber recalled filling out four RFPs, working with four different project managers, and twice being asked to submit old copies of completed paperwork. “We joked that the only thing we hated more than the RFP was not to be invited to one,” Garber says. “We always wanted to be invited to the dance, but sometimes we wished there was an easier way to get to the dance and actually dance when you’re there.” The perseverance paid off for ONOSYS — the company won the business of one of the largest casual sit-down chains in the world. This win did more than boost cash flow; it planted a seed that gave Garber and Yakubovich a general idea of what they wanted to do with their next business. After ONOSYS was acquired, the cofounders spent two-and-a-half years working for LivingSocial. During that time, they started thinking through how their knack for building simple, sleek software could alleviate the headaches of the procurement process. Just like that, Scout had a plethora of actionable customer feedback about its software without actually writing any code. Garber took that feedback to the development team with a ready-made road map. And those developers were able to — and still are able to — iterate very fast. Scout still uses this design-centric prototyping methodology, and it’s partly how the company is able to push new code to the platform every two weeks. Patiently engineering the customer feedback loop and development process is just one of the ways Scout has been able to grow (the company employs about 100). Once the software was built, the next step was to scale the company. Funding is never easy to get, but it was easier to secure investors since Scout already had customers acting as evangelists. Here’s the point in the story where Scout really breaks the Silicon Valley-based startup mold: They raised only what they needed, and they were extremely careful in how they spent it. Smart and sustainable growth. Yes, we’re growing, but we’re doing so in a controlled manner. The money we’ve raised goes directly into the business and our continuing efforts to build and bring the best product possible to market. So, what does it mean to put money toward building the best possible product? At Scout, it means hiring the right kind of talent and getting that talent in front of customers. Garber isn’t afraid to shell out dollars on things like trade shows or Spark (Scout’s customer conference, which draws 400+ people to San Francisco for two days in February to talk sourcing and strategy). He’s also adamant about giving his team face time with customers. It’s not cheap to fly employees around the country to sit side by side with users, but that kind of personal interaction is exactly what built the company in the first place. Garber spends a lot of time thinking about how to invest the cash Scout has raised, and he’s also very intentional about how the company spends time. For example, the executive team recently developed an employee training curriculum that they brand as “Scout University.” It’s designed to ramp up new hires, but Scout made every current employee go through the new program. Classes range from 30 to 60 minutes and are taught by various members of the Scout executive and management teams. Garber teaches a core class about where the company is in the marketplace and how the product competes. Yakubovich, the CEO, teaches the class on the company’s culture. An employee with direct experience as a sourcing manager before joining the Scout team teaches a class about a day in the life of a procurement professional. Once someone “graduates” from those the core classes, each manager teaches a department-specific curriculum that lasts for the employee’s first month and completes the onboarding process. 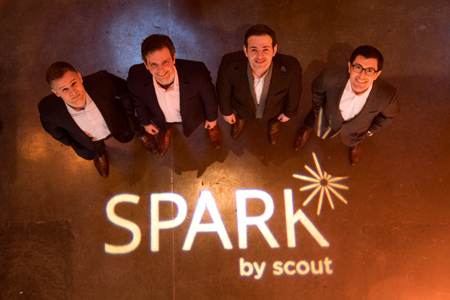 Scout University is just a small part of the way the four cofounders have scaled their vision for the company. This executive team also knows there is some fluidity to this vision. For example, they recently sat down to reevaluate the company’s core values. The value of “strive to be an A player” was struck from the record, because the company wants to hire only A players, rather than to strive for that performance. “Hit your milestones” was removed, too, because it was redundant once Scout implemented the OKR process. Every quarter, employees can give a little turtle figurine to a colleague who demonstrates and upholds the Scout values. The top performers get to wear capes, too. Why the turtles, and why the capes? Scout’s mascot is a Thunder Turtle, an idea randomly suggested by a friend when the company was still in stealth mode and in need of a project name. Turtles are thought of as wise, deliberate, and always end up winning the race against the proverbial hare. (The “thunder” part of the mascot, Garber admits, was really just because they liked the semantics of it.) It’s a fitting mascot for a SaaS company that took its time developing its software, a company that is wise about how it spends money and time, and a company that is focused long term on sustainable growth.